More than 20 years ago I had a lively discussion with a leading German politician who complained that Terre Des Hommes, the child rights organisation I was leading at the time, interfered with national politics. He abhorred our advocacy and campaigns and demanded that we “leave politics to the politicians”. This politician’s perspective was firmly rooted in a traditional understanding of democracy shaped in the 19th and early 20th centuries: once every four or five years people would undertake the often arduous journey to a polling station, cast their votes and return home, most of them leaving politics to the politicians until the next election. Since that conversation, the growth of digital communications means that politicians have lost their monopoly on politics. Representative democracy as we know it is under enormous pressure everywhere. Globally, a power struggle between governments and “their” citizens or, from my perspective, between citizens and their governments, is underway. The Internet has provided each individual with more and better means to inform themselves, to control politicians, to voice their opinion, to seek the support of others and to form powerful political alliances. The space for civic participation has grown enormously and power has shifted away from traditional political structures and actors. But politicians have not only lost power to the individual: as a result of accelerated globalisation they have also lost power to supra-national institutions such as the European Union and global ones, especially multi-national companies. What we observe today—and what many of us suffer from—are the responses of traditional political elites to their loss of power in both local and global directions: they try to reduce our space for political participation and they foster aggressive nationalism. Arguments such as, “We need to stop terrorism” or “We need to preserve our culture and/or religion“ or “We need to secure our living standard” are used around the world to justify discrimination against foreigners or minorities, and to restrict the rights of citizens. As the world moves from representative democracy, which depends on empowered politicians, to direct democracy based on empowered citizens, politicians find that their role as intermediary between people and politics is shrinking dramatically. But politicians are not the only ones suffering from disintermediation: civil society organisations are experiencing a similar erosion of their traditional role as intermediaries. Service delivery Civil Society Organisations (CSOs) such as CARE or Save the Children are facing a situation where donors can support organisations in the global South directly without having to go through a Northern CSO, and campaigning CSOs such as Greenpeace or Amnesty need to react to the fact that activists can find each other on social networks and don’t need a well-established intermediary any longer. Seen from this angle, both traditional politicians and traditional CSOs are part of an old world that is about to be replaced by very different forms of civic participation. This is in stark contrast to the perspective of most CSOs who see traditional politics as the problem and traditional CSO activities as (part of) the solution. The next generation of civic activists—the ones who create platforms like Avaaz and Change.org—view traditional CSOs as the dinosaurs that will go down together with traditional politics. 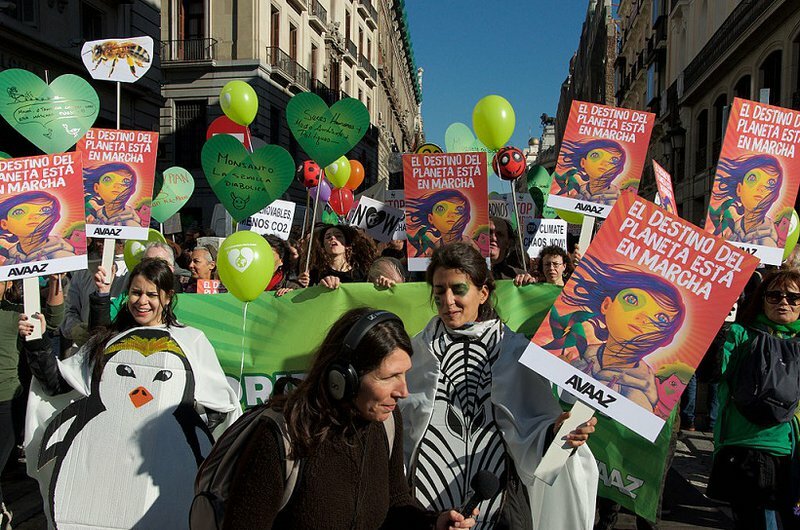 An Avaaz-sponsored climate march in Madrid, Spain. Groups like Avaaz and change.org have the ability to connect donors directly with activists throughout the world. The search for new business models in our sector is often driven by CSOs looking for new income streams to fund traditional activities. In doing so, they overlook the fact that funding for traditional activities often dries up because those activities are no longer considered relevant and effective. Thus the search for new business models should start with the search for new approaches to a specific challenge or opportunity. In regards to the fight for civic rights, the first question should be: how can we conduct the fight for civic rights most effectively? The occupy movement, the Arab Spring, citizens’ resistance in Turkey and other recent events have shown that people use social networks and other means of digital communication to organize the fight for their rights. To the chagrin of many CSOs, these organisations were not even asked to contribute, and, in some cases, they were as surprised by events as other actors in the dominant order. On the other hand, nearly all of these popular movements were unable to turn their early and often impressive gains into stable achievements. Usually the dominant elites reclaimed control, further reduced the space for citizens’ participation and increased oppression. How can the achievements of popular movements be secured and turned into stable progress towards just and fair societies? One possibility is to bring progressive and well-organised parts of the old order to the fore, offering their support to the people at a grassroots level, helping them to stabilise their achievements and turn these into a better future. However, such a coalition for rights and justice will require massive changes on the part of traditional CSOs: they will have to turn themselves from closed, branded and defended entities into open platforms serving the frontline activists. The second question, then, is: what resources do we need to pursue our strategy? We deliberately do not ask about funding here but about resources: money may not be our main problem. Many of the well-established CSOs have impressive budgets but far less impressive strategies. Supporting a large number of individual projects may make the status quo more tolerable to the poor and oppressed but it rarely helps with overcoming exploitation and oppression. To become more effective at times of disintermediation, CSOs need resources such as access to and credibility with frontline activists, legitimacy and strategic importance in the eyes of popular movements, the ability to mobilise and support people in the fight for their rights and many other non-financial resources. CSOs may no longer need the large budgets they administer at present, and they may not be able to raise large budgets in the future: becoming much more effective in fighting poverty and exploitation may not go down all too well with many of the CSOs’ traditional donors, specifically those that aim to maintain the present order. In his recent piece, Ed Rekosh listed a number of possible new business models to secure these resources—but in the end credibility and legitimacy with the people fighting for their rights is our most essential resource, and we generate that by providing effective support. If we are truly effective in our work, we will know exactly who our friends and enemies are. This may reduce the range of potential donors, compared with CSOs options today, yet it’s still good news for activists: money need not decide the fight for people’s right to participate in shaping their societies.